I am a Consultant Obstetrician and with a special interest in Perinatal Mental Health (PMH). I campaign for better PMH care within the Maternity Services. I firmly believe that the mothers and the famiies should be at the centre of everything we do as Healthcare Professionals. ‘Addressing Mental Health Conditions during pregnancy and beyond’ on Monday 20th November 2017, 1pm – 6pm, House of Commons (UK Parliament). This event is dedicated to all the mothers and their families affected by the Perinatal Mental Health (PMH) illnesses and aims at raising awareness on Maternal Mental health in the wider community by engaging people from all walks of life in the society. The previous year’s event (#HopeDec09) was highly successful and well received by the attendees. For those who could not join the event last year, there are some of the wonderful blogs written by: Carrie Ladd, Yvonne Newbold, Elaine Hanzak, Beverley Turner , Hannah Bissett and Laura Clark. There would be a series of lectures aimed at all the members of our culturally diverse society. Every member of the society from any professional background is welcome to attend. You don’t have to be working in the NHS or in the field of PMH for attending the event. To book a place and for further information/ press enquiry, please email pmhevent2017@gmail.com. The event is free to attend but only limited places are available at the venue. Please note that the attendees need to make their own arrangements for travel and refreshments as there is no funding available for catering or reimbursing the travel expenses. Expression of Interests is invited for 5 volunteers to help run the event on the day. The volunteer should be willing to stay throughout the duration of the event (1pm-6pm). Please send an email to pmhevent2017@gmail.com. I am very grateful to all my wonderful friends in the social media for their continuous support, encouragement and valuable advice. ‘Importance of addressing Mental Health Conditions during pregnancy and beyond’ on Friday 9th December 2016, 2pm – 5pm, House of Commons. Perinatal Mental Health (PMH) illnesses affect mothers, fathers, children, families and the wider society. We have lost many valuable lives as a result of PMH conditions. This event is dedicated to all the mothers and their families affected by PMH illnesses. This event aims at raising awareness on Maternal Mental Health in the wider community and engaging people from all walks of life in the society to remove stigma around the health condition. Sadly PMH illnesses are still surrounded by myths, stigma, shame and guilt. I strongly feel that we can only overcome these by raising awareness and engaging every single member of the society. PMH condition can affect ANYONE (irrespective of their ethnicity, cultural, financial, educational and professional background) during pregnancy and one year of childbirth. We all must come forward and work together to ensure that NO ONE suffers in silence in our society. There would be a series of lectures aimed towards all the members of our culturally diverse society. I am sure you would appreciate that three hours are not enough to cover every aspect of this health conditions. – Clair Rees (CEO, PIP UK). The event is expected to be attended by members of the society from different backgrounds from all across the country and abroad. As there are only limited places in the venue and strict regulations, attendance to the event is invitation only. I do sincerely apologise in advance to turn down many requests. Hope you would all understand. However if you would like to attend, please send an email to: pmhevent2016@gmail.com. You would be notified if any place arises in the future. We all must remember the impact of untreated PMH conditions in pregnancy. I am very grateful to Mr Richard Harrington MP (Parliamentary Under Secretary of State for Pensions) and Mr Barry Gardiner MP (Shadow Minister for Energy and Climate Change) for jointly sponsoring the event. I am also very grateful to all my great friends in the social media for their continuous support, encouragement and valuable advice. It was a great honour for me to be able to lead and chair the Community event on Maternal Mental health at Watford (Herfordshire, UK) on Friday 15th July (6-8pm). The event was jointly organised by the West Hertfordshire Hospitals NHS Trust and the Herts Valley CCG. The aim of the event was to raise awareness and reduce stigma around the perinatal mental health illnesses (PMH). We also took the opportunity to launch our Lavender Team. misuse, Female Genital Mutilation, teenage pregnancy and complex social issues). I am indeed very proud to be able to work with this wonderful and very passionate team who always go out of their way to support the mothers and their families. The event took place at the Westfield Academy School at Watford. I am very grateful to Rt. Honble Richard Harrington, MP (Watford) for his immense support. Although he could not attend but sent us a letter of support. He spread the word in the Facebook page, Twitter and his website. Since I met him in the Parliament last year, Mr Harrington has been a great source of inspiration for my work. I am also grateful to Mr Chris Hubbard and his team at BOB FM Radio for the interview and broadcasting the event details. We also had great support from the Pulse Hospital Radio and the Trust Communications team for the press release. Prof Steve Barnett (Chairman) made the inaugural speech and it was followed by the launch of the Lavender Team by Tracey Carter (Chief Nurse). This was also supported by Liz Biggs (Children, Young People and Maternity Programme Lead from HV CCG). It was an honour to listen to Helen Birch, who shared her experience and an incredible journey into motherhood following the sad death of her husband during her pregnancy. Her courage and strength are exemplary. We are very grateful to Elaine Hanzak (inspirational speaker, author and a great PMH campaigner) for her support and kindly agreeing to speak at the event. Elaine also had to take the trouble to travel a long way to reach Watford. This shows her dedication and commitment to raise awareness and improve care in PMH. A great supporter of our work, Mr Iain Cunningham (the Director of the documentary film, Irene’s Ghost), spoke about his journey to rediscover the life of his mother. She sadly died when he was three years old. This film is such a brilliant initiative to highlight the stigma, shame, silence and endless sufferings from Postpartum psychosis, which can cost valuable lives. It was very inspirational to hear about the fantastic work by three Peer Support groups: Peony PND support North London (Charlotte Antoniou), Butterflies Community support (Rebecca Mccann) and Hertfordshire Postnatal Illness Support (Herts PNI). Kay Gilmour (Head of Children’s Universal Services at the Hertfordshire Community NHS Trust) spoke about the Health Visitor team’s vision and commitment in PMH. PMH illnesses can lead to a long term traumatic memory, as described by Ajitha Simkhada (one of our Senior Theatre Sisters) and Penny Snowball (Writer/ Filmmaker), while sharing their personal experiences. Lucy Sims and her team from Hertfordshire County Council presented their exciting project, “My Baby’s Brain”. It was a truly inspirational evening for me and I am looking forward to work with the whole community to improve the care and raise awareness in PMH illnesses. It was a great honour to be invited to speak at the ‘Begin Before Birth’ (BBB) Conference yesterday (16/06/2016) at the Imperial College London. This annual Conference is organised by Prof Vivette Glover. She is an international expert on the effect of the mother’s emotional state in pregnancy on the development of the fetus and her child. I felt very humbled to be on the Panel of speakers with other renowned experts in the field of Perinatal Mental Health (PMH), such as Dr Alain Gregoire, Dr Sue Pawlby, Prof John Cox, Prof Pasco Fearon and Prof Jane Barlow. I have always learnt and would continue to learn from their work and they are true inspirations to us as the Health Care Professionals (HCPs) and everyone involved in PMH. My topic was the ‘The role of Obstetricians and Midwives in Perinatal Mental Health’. Sadly the role of the Maternity Services in PMH has remained poorly understood, therefore it has remained ‘Cinderella’ in Obstetrics. Many staff within the Maternity Units are not even clear of their roles and responsibilities with regards to PMH. Moreover there is no agreed national framework for PMH pathways within the Maternity Services across the country. We often do not realise that PMH (eg. depressive illness) is by far the most common major medical complication in pregnancy (This was acknowledged by Dr Gregoir during his talk yesterday). He also emphasised that the perinatal period is the most efficient time for detecting depression in women. Moreover the Confidential enquiries into the Maternal deaths in the UK have repeatedly shown that failings often start during pregnancy. My letter published in The Guardian in response to the sad death of Charlotte Bevan (and her daughter), can be found here. However the risk factors could be significantly mitigated with many preventative measures during pregnancy and postpartum period. The suffering and deaths can be prevented. I would encourage everyone to read the excellent document Prevention in Mind. We should always remember the importance of psychological wellbeing of ALL mums (irrespective of their mental health history) irrespective of the outcome of pregnancy. Therefore parents with pregnancy loss (miscarriage/stillbirth), neonatal death, traumatic birth experience and babies admitted to Neonatal Intensive Care Unit (NICU) should get appropriate care and support. We must not forget that PMH can affect the dad and can lead to relationship conflicts between the couple. I am grateful to Dr Diane Speier for forwarding me one of her an excellent articles. During my talk, I quoted some evidence from that paper on how it affects the relationship between parents. For those above reasons, I am campaigning for better PMH care within the Maternity Services. During my meeting with Baroness Julia Cumberlege (Chair, Maternity Review) in September (2015) at the West Hertfordshire Hospitals NHS Trust, I highlighted the need of improved PMH care within the Maternity Services. Following that this issue was taken seriously within the Maternity Review. I have raised this matter with senior team members of all relevant Royal Colleges, Maternal Mental Health Alliance (MMHA) and NHS England. I met senior politicians and campaigners to focus on this neglected area. I also highlighted the role of the Maternity Services at the All Party Parliamentary Group (APPG) 1001 Critical Days meetings at the House of Commons and during a recent debate at the House of Lords. I always believe that PMH care is NOT always about funding. We as HCPs must never forget priceless human values such as kindness, listening, smile and use of sensible appropriate words during interaction with the mums and their families. We must remember to put the mums (and their families) first and foremost of everything we do. They are over and above any ‘clinical criteria’/’guidelines’/’pathway’. We must individualise care at every step. We must be bold enough to stand up and challenge existing beliefs and ideas if they are not fit for purpose and not for the best interest of human lives. Finally, we must believe that ‘it is possible to make a difference’ through collaboration, working together with and (most importantly) listening to the mums, their families and the wider community. I was honoured to have been interviewed for some of the articles recently to express my views and share my experiences of working with mums and their families affected by PMH illnesses. I am indeed very overwhelmed by the response following their publications. I strongly feel that psychological care during pregnancy is very important for ALL mums throughout pregnancy and beyond, irrespective of their mental health history (and also irrespective of the outcome of the pregnancy). Therefore symptoms should not be ignored during pregnancy. The importance of the treatment of antenatal depression has been highlighted in the article published in the Huffington Post. Similarly there are three important contributory factors for post childbirth mental health conditions: guilt, sense of ‘failure as mum’ and the feelings of ‘loss of control’. I must emphasise here that PMH illness is NOT a sign of ‘weakness’ or ‘lack of confidence’. Rather it’s a health condition which needs treatment; and with adequate care, support and advice, full recovery is possible. I was also very proud to be mentioned in an article by Dyane Leshin-Harwood: ‘I Had a Postpartum Disorder You’ve Probably Never Heard of’. Every mum needs to be listened to by the health care professionals (HCPs) and care must be individualised. We, as HCPs, must create an environment where mums (and dads) can express their concerns, without any fear of being judgemental. Therefore mums and their families must be the first and foremost and centre of the Care Plan at each and every step. Mums (and dads) should be given choice, options and all possible evidence based information, so that they can decide the best course of action for them. I always feel that it’s so appropriate for us, as HCPs, who are involved in the care of mums and their families affected by PMH illnesses. I hope to achieve that mindset one day to provide the best quality of care…. I liked your headline “Why NO woman should have a home birth: Government drive to free up hospital beds will lead to rise in ‘dead or damaged babies’, doctor warns“. It was certainly attention grabbing, which is the measure of a great headline, right? It’s less important of course that the headline be accurate. It was particularly eye opening for me because I have read a lot about the new proposals to support birth choice with a great deal of interest, as both an expectant Mum and antenatal teacher, but I never knew it was motivated by a desire to free up hospital beds. You must have insider knowledge. I was naive enough to think it was a positive step to empower women and improve outcomes for mothers and babies. International Women’s Day (IWD) is very special day for me as a Consultant Obstetrician as I am directly involved in the care of women during their pregnancy, childbirth and postpartum period. As the Perinatal Mental Health (PMH) Lead, therefore, it is vital that I do everything I can to improve care of the mums and their families within the Maternity Services, especially with regards to PMH. IWD also reminds me the importance of working closely with my team, community and other national campaigners in the field of PMH. As an Obstetrician, I feel ashamed that PMH has still remained one of the leading causes of Maternal death in the UK (MBRRACE 2015) in spite of extraordinary developments in medicine. I entirely agree with another great campaigner Sanchita Islam that it is a global health problem and not only confined to the UK. I decided to celebrate IWD on Tuesday, 8th March 2016, focussing both on my clinical work and my campaign for better PMH care within the Maternity Services. The day started at my PMH clinic working with an inspirational team at the West Hertfordshire Hospitals NHS Trust. I firmly believe that as Health care Professional (HCPs) we must listen to the mums and their families and keep them at the heart of everything we do. Recently we have introduced an information leaflet summarising useful contact numbers for women with mental health conditions. We are now considering this to be included in the Maternity Records. We reinforced the importance of empowering mums (and their families) during our team briefing that day both before and after the clinic. In the afternoon, we had a meeting with a local PMH Peer Support group. We, as a team, strongly believe in establishing a strong working relationship with all the local community services. We are now successfully working closely with many Peer Support groups and very grateful for their enthusiasm and hard work. I then spent the rest of the afternoon with my other clinical works. I also had an opportunity to speak with some of my patients who wanted to discuss their concerns. This is often not possible during the scheduled clinic hours. To address this issue, I am very keen to set up Drop-in sessions in PMH so that mums and their families have better direct access to senior clinicians. In the evening, it was an honour for me to have a meeting with inspirational Mr Dan Poulter at the House of Parliament, to lobby for better Perinatal Mental Health (PMH) services. I am very grateful to him and his team to arrange the meeting in the evening, so that I could attend after my day’s work. Mr Poulter was the Minister of Health (Parliamentary Under Secretary of State in the Department of Health) 2012-2015. He is very passionate about improving care in PMH and did a lot of pioneering work during his ministerial role. He happens to be an Obstetrician too! Therefore he has great insight into the current challenges in the PMH care provision within the Maternity Services. He gave me some wonderful suggestions to move the PMH agenda forwards. He kindly agreed to help with improving the Maternity Commissioning for better patient-centred care in Perinatal Mental Health: an area which has remained neglected for long. I now have greater optimism and hope and firmly believe that PMH care would definitely improve soon. Statistically, if you have experienced PND previously you have a 50/50 chance of experiencing it again during a future pregnancy and/or postnatal period. 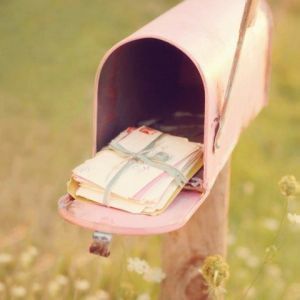 I’m not pregnant but I hope to be one day and I wanted to write this letter so, if I am unwell again and consumed by PND’s lies, I will have something concrete to read. I plan to do everything I can to prevent or reduce PND but it’s good to have a Plan B.
I know you’re frightened, I remember it. Perhaps I don’t remember it well as when the anxiety leaves you the memory fades too. Self-preservation, I suppose. But if I close my eyes and take myself back I can remember the terror and panic and feeling of wanting to claw myself out of the world. The way you are feeling again now. The strange thing about the internet, and particularly blogging, is that it’s often easier to disclose your deepest, darkest feelings to a world wide web full of strangers than to the people you’ve known all your life. There is something about the anonymity of sitting behind a screen that’s really comforting and makes us feel safe. And even if you’re not anonymous, even if your photo and real name are right there in the corner for all to see, you can still bask in the knowledge that it’s unlikely anyone you know is going to stumble across your minute corner of the web without prompting. And I’ve never prompted. I’ve been writing this blog for ten months but I’ve never put it on my real name, honest-to-God Facebook profile. Until two weeks ago.